Shockwave Therapy, heal spurs and plantar fasciitis … Everyone has heard of Plantar Fasciitis and everyone has heard of Heal Spurs but not everyone has heard of Shockwave Therapy. There is so much confusion and misinformation on Plantar Fasciitis, Heal Spurs and what to do about the painful condition. There are even Doctors telling Patients that they need to “live with” the condition. Here at Montgomery Massage Therapy we specialize in Shockwave Therapy and Active Release Technique. I am going to explain the condition and why these are the best two options for treatment. The Plantar Fascia stretches from your calaneous (heal bone) to the base of your metatarsals (toes). 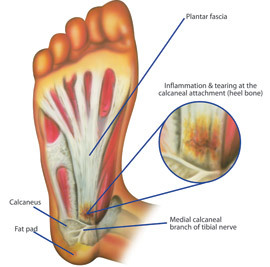 Plantar fasciits is a condition in which the attachment at the heal becomes aggravated and inflamed. This is often misdiagnosed as a Heal Spur. Very simply, the fascia needs to be lengthened to allow relief and recovery at the attachment point. Tension needs to be taken off the attachment and the inflamed damage tisuse needs to be treated and brought back to life. 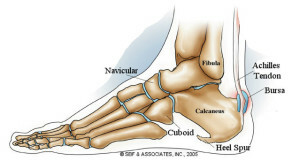 Plantar Fascitiis and “Heal Spurs” are conditions that people suffer with for a very long time. There is no need to suffer. Get the condition properly treated. At Montgomery Massage Therapy we will treat it with Active Release Technique and Shockwave Therapy. Often the Plantar Fascia tightened up due to very tight lower leg muscles. The treatment will start with Active Release Technique applied to the entire lower leg and foot muscles. Once the leg and foot is released we will apply the Shockwave Therapy to the symptom site, the medial aspect of the calcaneus bone. So many people suffer from this condition. Please share this information.